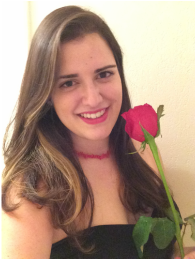 Erika Vasallo is currently studying vocal opera performance under Linda Considine at New World School of the Arts College Division and graduated with highest honors from Miami Dade's Honors College, where she was on a full academic scholarship. Her passion for classical music began over a decade ago, when she was the youngest child to be accepted into her elementary school's choir. She has won numerous awards including superior ratings at FVA Solos & Ensembles, FFMC, NFMC, as well as The Maestro Award for her solo performance at The Chicago Heritage Festival. Throughout her four years in high school, Erika was selected to participate in the prestigious FMEA All State Sight Reading Choir and All State Women's Choir. She interned as a stage manager assistant at the Florida Grand Opera during the 2011-2012 season for the opera Romeo et Juliette. At NWSA Erika has performed in Opera Scenes from La Traviata, Die Zauberflote, La Cenerentola, Tenderland, and Signor Deluso. In January 2013, she debuted for The Opera Atelier, at the Aventura Arts & Cultural Center. Erika currently serves on CMN's Board of Directors.